Funding for this project has been provided by Michigan Council for Arts and Cultural Affairs, with associated funding from the National Endowment for the Arts. All of our members are invited to contact their federal and state representatives to tell them how important it is to support these state/federal arts agencies. We also thank the contracting firms of Mountain Stone, Inc. of Sault Ste. Marie, Nomad Construction of Sault Ste. Marie, and Sanders & Czapski Associates of Marquette, Michigan. 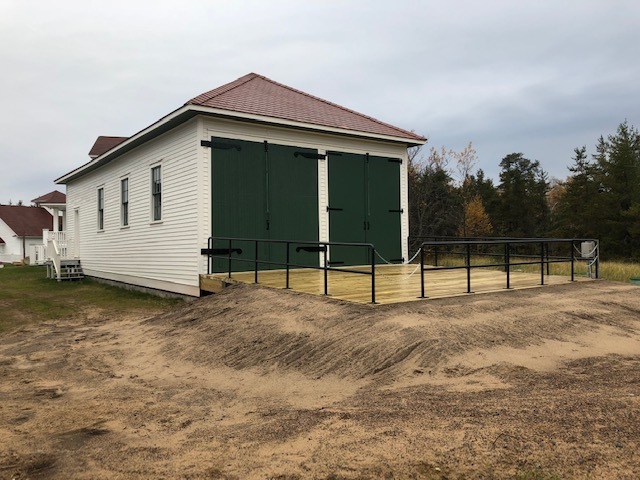 Capital projects, both new and restorative, at the Whitefish Point Light Station are always a challenge because of its weather and remoteness, which of course is a significant element of the public attraction to this National Historic Site. Installation of the rails, fabrication of the cradle, and fabrication of the motorized system to winch USCG 38361 in and out of the building will take place just prior to delivery of the Motor Lifeboat to Whitefish Point in the summer of 2019.